The Sea-Ray arguably looks a lot like a Nokia N9. To MOST who would take a look at the two, they’re identical. Except of course if you follow tech a little, especially if you’re a Nokia/MeeGo/WP fan. The N9 is an official Nokia-MeeGo handset. Sea-Ray is an unofficial leaked handset. Such confusion is possible. 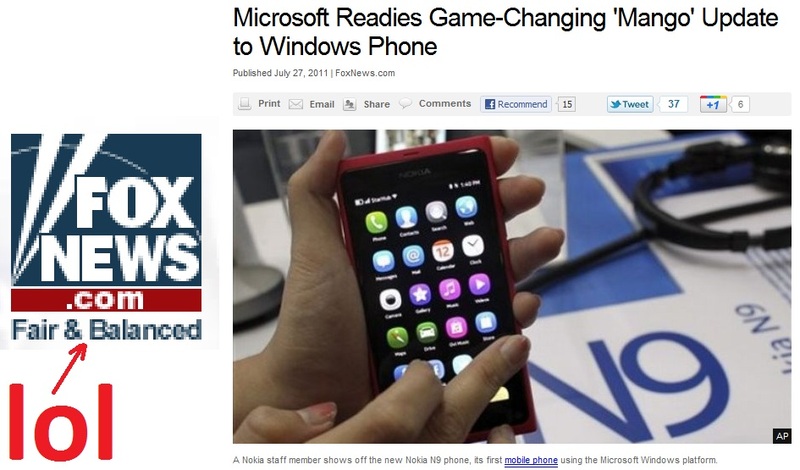 Fox-News recently published a post with a picture of the N9 in a post about Windows Phone with a caption under the N9’s picture as, “A Nokia staff member shows off the new Nokia N9 phone, its first mobile phone using the Microsoft Windows platform.” Maybe they got some letter confusion between mEEgo and mANgo? The funniest part is still the fox news slogan. The confusion you could say is forgiveable. At least it’s not as drastically erroneous as the Gadget Show’s picture of “Symbian^3 powered N8” instead a poor google-pic selection of a N810, maemo tablet (it’s not even a phone). Do you think the general public would immediately know the difference between N9 and Sea-Ray? Would they care what OS it runs? Cheers for the tip, manojlds.